Web memorial for murdered teen His nickname was "Lil' Man," and he used it with pride. Matthew Martins is remembered as a personable, good-looking young man and able amateur rapper on an Internet website established to commemorate the 16-year-old Vancouver resident who was killed on the Canada Day weekend at the Surrey Central SkyTrain station. 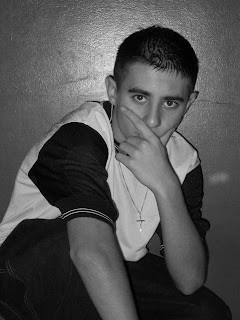 The Internet site at http://www.matthewmartinstribute.com/ features photos and a brief downloadable video of Martin "free-styling" a rap song where he calls himself "Lil' Man." The same nickname is affectionately repeated in multiple messages posted on the website by friends and family who recall the short, slightly built Martins as a larger-than-life personality who had many friends. "RIP Matty (Lil Man)" reads one guestbook entry from a female friend. "You taught me never to take my friends for granted, you taught me how to love people I just met, how to be patient with them even when they're being jerks, how to speak peace even to those who are mean to me and so much more ... Thank you for being my friend, my brother, and a piece of me." Martins' mother calls her son by a different nickname, "boo" in her message. " ... how do we go on from here boo? I sit staring at your photos, so scared that you will start to vanish from my minds eye. I listen to your voice on your recordings, so that I can hear the sweetness of your voice. ... . Your birthday is just around the corner, I'm trying to think of something special we can do for you. If you can think of something, come to me in my dreams and show me ... Matthew, please send mommy a sign and let me know you're okay." Martins died in hospital a few hours after he was found lying in a pool of blood at the bus loop near the Surrey Central SkyTrain station July 2. The teen had taken the train to visit some friends in Surrey. Two people have been charged with second degree murder in his death, Katherine Anne Quoin, 22, and Robert Allan Forslund, 27, both of Surrey. The pair have been held in custody since their arrest. Last Wednesday afternoon, the couple made brief appearances in Surrey Provincial Court, just long enough to book their next court appearance later this month. As the sheriff's officer removed Forslund before bringing in in Quinn, they crossed paths long enough for him to yell at her, "I love you," and for her to reply, "I love you too."